Heeft u een vraag voor Russian Hostel? Russian Hostel, gebouwd in 2012, is een aanwinst voor Hong Kong en een slimme keuze voor reizigers. Gelegen op 0.1 km van het hart van de stad, bevindt dit 1-sterren hotel zich op een excellente locatie met de grootste attracties binnen handbereik. Dankzij de praktische locatie liggen alle belangrijke trekpleisters in de buurt van het hotel. Het Russian Hostel biedt een onberispelijke service en alle essentiële voorzieningen om reizigers een plezierig verblijf te bieden. Enkele voorbeelden van faciliteiten die dit hotel biedt zijn gratis wi-fi in alle kamers, 24-uur receptie, snel in- en uitchecken, wi-fi in openbare ruimtes, vervoer van/naar luchthaven. Ervaar kamerfaciliteiten van hoge kwaliteit, inclusief plasma tv, internet (draadloos), draadloos internet (gratis), rookvrije kamers, airconditioning, om tot rust te komen na een lange dag. Daarnaast garanderen de talrijke recreatieve mogelijkheden dat u zich tijdens uw verblijf kunt vermaken in het hotel. Het Russian Hostel is een slimme keuze voor mensen die reizen naar Hong Kong: een ontspannen verblijf is gegarandeerd. Why did you check us in the NEW TOKYO HOSTEL? I have ezpexted to be checked in the RUSSIAN but you did not because the rooms were full.. How can you not reserve it for us when in fact we already paid for it? Staff were not organized. Toilet bowl is moving. Not clean room. My booking was a double bed room of 11 sg metre. Two of us were provided a single small room less than 11 sg metre. The shower water was weak. TV had one channel only and burred. First, the lift. We wasted sooo much time waiting for the lift EVERYTIME! Second, cleanliness! The place stinks and its so dirty! Third is the roomboy. i was having a shower when he knocked 2 times. Ofcourse i couldnt just go out to open the door (though its just 3 steps from the toilet to the door...THE ROOM IS TOO SMALL!). Grabbed my towel to go near the door and when im about to ask him what he wants, boom! He unlocked the door using his keys!!! i said, "HEY!" and pushed the door and locked it as fast as i could! Then i asked him what he wants. He replied "are you checking out today(almost 2hours before the check out time)?" i said yes! He kept on talking, i didnt understand what he was saying(i guess bec hes an Indian. No offense, i just really couldnt understand). I just told him that i'll go to the reception in a bit to check out then finally he stopped talking. Another thing, its as if the kitchen is just next door to us. I could taste everything theyre cooking just by smelling. The smell stays on our clothes! Toooo many issues to mention! This is what i got for getting a lower cost place to stay in. I was just trying to save some cash... I guess it wasnt a crime, thou! Checked out ASAP and transfered to another HOTEL in Tin Hau. Learned my lesson in an awful way. Room services - daily cleaning was good. The location was great in the city centre. Able to survive the trip from door to room. There's too many indians/african loittering around on the lobby/ground floor which is also their sales booth area which is often discomforting and feels as if we were being watched. The security aren't often around at the lift areas to ensure safety. Not recommended for females only group. it is a good location but to go to the hostel you must pass many ppl who offering you a lot stuffs, it bit inconvinience but there always have a security in every spot to patrol or even guide us .. there also a small lift and inconvinience if you are in group or bring big luggage. Don't stay at ChungKing Mansion. The room was too small, we can barely move and I even booked a family room just for the 2 of us. It was cleaned everyday but you can still see strands of hair everywhere. We can hear people talk from the other room. The only thing I like about is the Wi-fi connection. My friends and I stayed in this hotel for 2 nights, we had a good time in Hong Kong. Good location and price was affordable. Though the service was quite bad but compare to the price and location, it's not that bad. Its really cheap & clean. Its cheap & centrally located but the bed is so very hard. My bed looks like someone has slept in. My daughter & I are freaked out. The caretaker (a teenager) sleeps on the floor in living room. As a mother, I think single female traveller shd not stay there for I know I will never go there agn!!! It was pretty convenience to get to the train just across the road,they clean the room everyday,downstair of this building pretty crowded with many indian stores. 1.Have microwave and boiled water. 2.Coffee also refill everyday. Can take as many as you can. 3. Near TST MTR. 100m walk only. Space area only 3m x 3m. Small but comfort. Have hot shower and safety box. This hotel is located in high rise building, a bit dark, lots of agents will offer you hotel rooms on ground floors. Russian Hotel is manage by some Indian guys, the room is small but enough for both of us. The air cond, hot water, tv is functioning well, they also provide hot and cold water for free at the hallway. Strategic located at downtown, easy to get food, walking distance to avenue of stars. Becareful when using the building lift, pickpokects is wondering around. A good location to access the tourist spots. Lift is small but fortunatelty the hotel is located in the top floor where we are easy to get the lift. Clean. Basically it is a good hostel but too may other hostels in the building and you can see many customers and become complex of seeing different people in the building. The lift is too small and fit for seven to eight persons. Fortunately the hostel is located in the top floor and it is almost impossible to get in if you stay in the mid floor of the building during the peak time. You can get convenience store downstairs and shops everywhere. The location is great because it is near the MTR station. The room we got is a 3 single bedroom. The space is just enough though we only stay there to sleep and take a bath. The bathroom is also small but we found it cute. 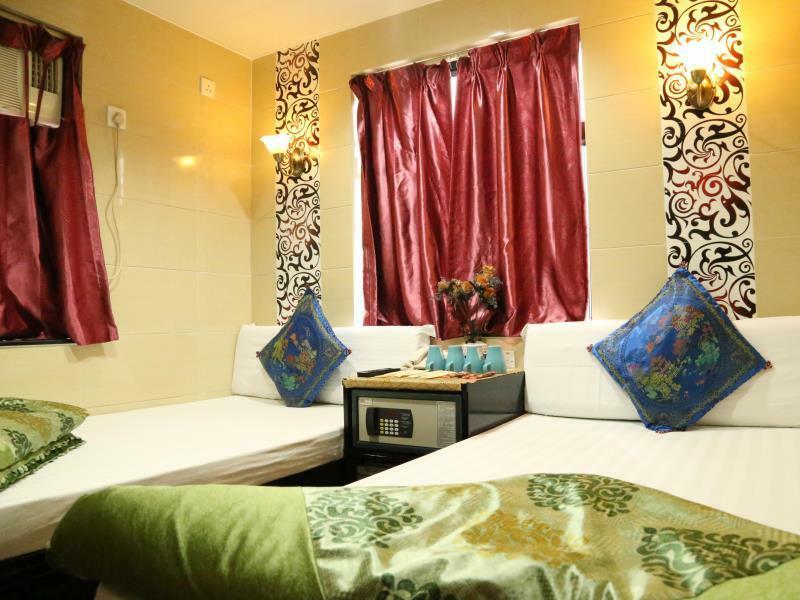 The room has also amenities like ref, flat TV, safety box and hair dryer. We felt safe inside the hotel room. Just a little advice, just ignore those salesmen (not sure if they are Indians) at the ground level asking you to buy various things. You might scared at first but i think they are harmless. Personally I think this hostel is not suitable for female solo or female groups to stay, or the hostels in Chung King Mansion are not suitable to. I don't feel safe when I got off from the bus in front the building. All the Indian (not sure if they are Indian or other races) hostels staffs came around to propose their hostels or restaurants to the people pass by. I felt threaten, but actually everything is alright, only felt uncomfortable at first. The lodge is good, clean and well maintained but the chun king mansion itself is a bad choice to stay especially if you are couples or with children. We as a bachelors itself cant stay here peacefully as every day there is some kind of a problem and police comes and knocks your door with some badly hurted bleeding guy. Only if you are very limited in money stay here.